Home » Crafts & DIY » Celebrate Thanksgiving with an Ice Cream Cone Craft! Celebrate Thanksgiving with an Ice Cream Cone Craft! Now that Halloween is officially over, we’ve changed up our mantel decor and it’s time to switch gears! I love that many of our favorite pumpkin crafts work great for the days leading up to Thanksgiving. But this ice cream cone craft is absolutely perfect for making in November! 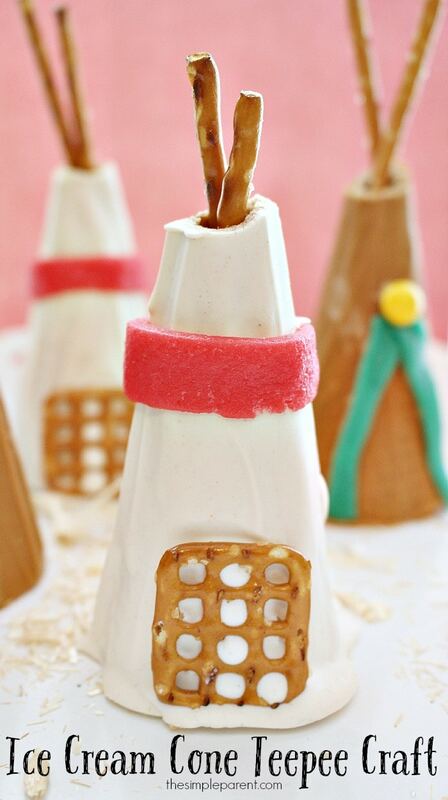 You can even make these sugar cone teepees and use them as part of your Thanksgiving place settings! Or just enjoy eating them when you’re done decorating! If you’re looking for something to do with the kids one weekend in November, this is a fun way to get in a festive mood. Plus this ice cream cone craft is a yummy treat to enjoy when you’re finished! We’ve included some affiliate links in case you need to buy some supplies. And check out the end of the post for some great book ideas to go with this craft! Before you melt the candy melts, prepare your waffle pretzels and Airhead candies. Unwrap the Airheads and cut horizontal strips and triangle shapes to decorate each teepee. In a microwave-safe bowl, microwave the white candy melts for 40 seconds and stir. If not completely melted, microwave in 10 second increments and stir until melted. 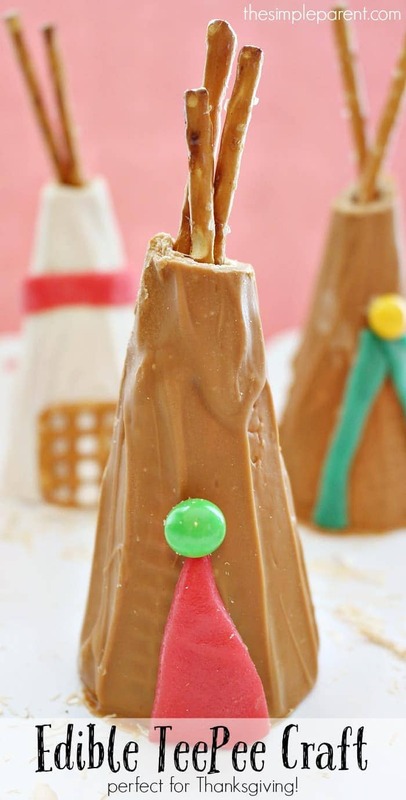 Use a spoon to coat 3 of the sugar cones with the melted chocolate and peanut butter mixture. Place upright on the wax paper to set. Before the cones are completely dry, firmly press waffle pretzels/ Airhead triangles into the cone to resemble a door/entryway. Wrap the airhead horizontal strips around the teepees for decoration. If needed, apply additional melted chocolate to insure it sticks. In a microwave-safe bowl, microwave the brown candy melts for 40 seconds. Stir. If not completely melted, microwave in 10 second increments and stir until melted. Let set for a minute to thicken. Using your spoon, coat the remaining 3 sugar cones with the melted brown chocolate. Place upright on the wax paper. 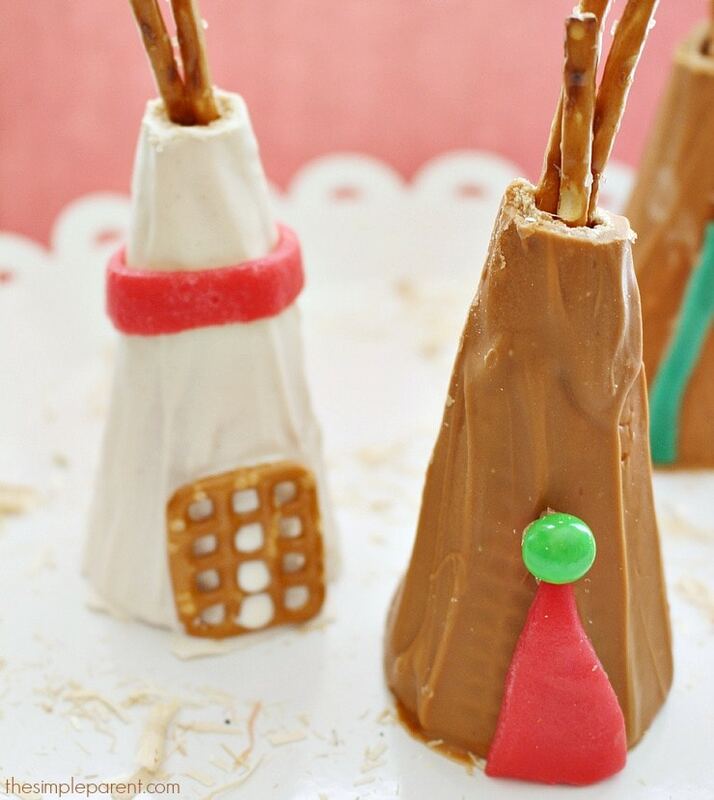 Using a toothpick, apply melted chocolate onto the Sixlets and attach to the teepees for additional decoration. Once the tepees are completely dried, snip off the top of the cones with a scissors-leaving enough room for two pretzel sticks to fit. And if you’re looking for some books to read together after you make your ice cream cone craft teepees, here are some of our favorites for this time of year! We hope you and your family have a happy Thanksgiving and a wonderful holiday season!